We’d love your help. Let us know what’s wrong with this preview of Annie Leibovitz by Annie Leibovitz. 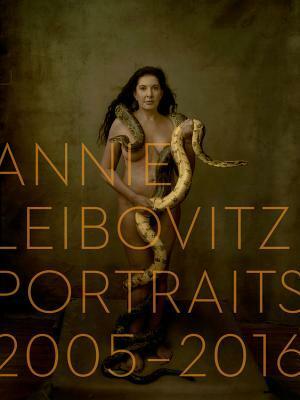 Annie Leibovitz: Portraits 2005-2016 is the photographer's follow-up to her two landmark books, Annie Leibovitz: Photographs, 1970-1990 and A Photographer's Life, 1990-2005. In In this new collection from Annie Leibovitz, one of the most influential photographers of our time, iconic portraits sit side by side never-before-published photographs. Afterword by Annie Leibovitz. To ask other readers questions about Annie Leibovitz, please sign up. Boy, is this one off to a booming start: Near the beginning, you will find a full-page spread from 2006: The Donald at the wheel of a silver, gull-wing sportster. Melania, hugely pregnant and scantily clad in gold lamé, coming down the back stairway of a Gulfstream.... Classic. I have NO IDEA how she gets people to pose the way she does. Trump is preceded by a buff, bare-naked Lady Gaga, back arched and VERY fit. A nice pairing, I thought. Two hucksters! Queen Elizabeth looks great at age 90! He Boy, is this one off to a booming start: Near the beginning, you will find a full-page spread from 2006: The Donald at the wheel of a silver, gull-wing sportster. Melania, hugely pregnant and scantily clad in gold lamé, coming down the back stairway of a Gulfstream.... Classic. I have NO IDEA how she gets people to pose the way she does. Trump is preceded by a buff, bare-naked Lady Gaga, back arched and VERY fit. A nice pairing, I thought. Two hucksters! cute kids, bizarre costumes. Movie set, I presume. Classic! And the book opens with an (uncredited) photo of Annie with her three daughters. Sweet. Second photo is Kim Kardashian & Kanye West with baby North West[!] in hir nursery, Kim & Kanye both taking selfies, family group backed by an oversize mirror.... Can we say, Narcissus overload? No index! Bah. Well, kinda sorta, a list of people photographed at the end. And the pagination is erratic at best. OK, it's a book for browsing. You'll find your own favorites. Comments have some previews, and Annie's comments. 6 stars! Most highly recommended. https://www.wsj.com/articles/annie-le... [paywalled, I think] -- I'm always happy to send copies of WSJ stuff to GRers. Just ask. Bonus photos online! Uhm, I just love this. And Annie. AND PHOTOGRAPHY. Uggggh. Ms Leibovitz has continued to document people of our time. Her portraits have captured the moments that have instantly become the past, and some of these photographs may well be the last images we view of a few subjects. Wow--this is an amazing book of portraits. I've known of Leibovitz but never studied her work before; the composition, windows, rooms, reflections, the inside and outside, the gaze--all were fascinating and raised engaging questions about who is where, what does placement/reflection/gaze mean for the portrait sitter, for the artist, for the viewer? I want to view more. I loved the portraits and the brief notes. Many of the photographs in this collection are compelling. They consistently give insights into the subjects' character, and they sometimes capture the ambiance, often the working environment, around each person. In a way, the photographs tell stories about people and their places in their world; however, the individual stories don't add up into a larger tale the book is trying to tell. And technically, the photographs, through precise lighting, effectively draw the viewer's eye into the subject Many of the photographs in this collection are compelling. They consistently give insights into the subjects' character, and they sometimes capture the ambiance, often the working environment, around each person. In a way, the photographs tell stories about people and their places in their world; however, the individual stories don't add up into a larger tale the book is trying to tell. And technically, the photographs, through precise lighting, effectively draw the viewer's eye into the subjects' world and seemingly into their souls. So as a technical accomplishment, the book is well worth considering. But as enjoyable viewing/reading, the book falls short. Almost without exception, the subjects are deeply serious, and in some cases seemingly sad. This mood, combined with an often dark, shaded color palette, left me in a somber state of mind. I kept longing for some sense of whimsy and fun, something joyous and bright, a change of pace in feeling. The book is important, but not enjoyable; it's an achievement, not a pleasure. As a result, I ended up asking: Has Leibovitz captured her own mood but not that of her subjects? Was she uninterested in exploring the brighter side of some of these people? Has she imposed her own mood on her subjects, a feeling that's not always their own? Annie Leibovitz is a controversial but brilliant photographer. She's faced blizzards of criticism for both her work (portrait of Miley Cyrus) and her stormy personal life (drug addiction, financial issues) but refuses to concede defeat and continues to take amazing pictures. Not all of her photographs are memorable but she is the creator of some of the most famous photographs of modern times e.g. John Lennon/Yoko Ono embracing, Demi Moore pregnant, Whoopi Goldberg bathing in milk. So, here's her Annie Leibovitz is a controversial but brilliant photographer. She's faced blizzards of criticism for both her work (portrait of Miley Cyrus) and her stormy personal life (drug addiction, financial issues) but refuses to concede defeat and continues to take amazing pictures. Not all of her photographs are memorable but she is the creator of some of the most famous photographs of modern times e.g. John Lennon/Yoko Ono embracing, Demi Moore pregnant, Whoopi Goldberg bathing in milk. So, here's her most recent work: a huge coffee table book that weighs six pounds and costs $80.00. It's full of interesting images but hey, skip the intro. Boring. A stunning collection of Ms. Leibovitz’s works between 2005 and 2016. I’ve always admired this particular photographer’s work and this collection certainly doesn’t disappoint. Chuck full of famous and not so famous faces, you’ll find plenty to feast your eyes on since Leibovitz uses her camera like an artist uses her or his brush. Definitely recommended for admirers of photography as a participant and as a connoisseur. What a great way to spend a Sunday, slowly taking in all the pictures and portraits. There is a biographical sketch in the back of the book to let me know who some of the artists were. But I could list more! For any of you out there not familiar with Annie Leibovitz' work...I highly recommend you check out her photographs. These aren't just pictures but truly stunning photography. This book contains some famous places as well as famous people in compelling poses. Classic portraiture, especially the portraits of the most recent Presidents and their spouses. I could sit with a book of portrait photography for hours and this is no exception. Sigh. Fascinating. Wonderful Photographs capture stories not just faces. Lacking words to express the emotional impact of the images. Her photographs only get better. This is a collection of Annie Leibovitz's photos. Some are better than others. I question the inclusion of some of these in this collection. Can’t honestly claim to have “read” this but that’s my only choice to place it on my shelf of read books. Looked at every page though, and there are some interesting ones. Evocative, in a way that only Leibovitz can capture. Nice collection of this well-known photographer's work in large format images. Anna-Lou "Annie" Leibovitz is an American portrait photographer whose style is marked by a close collaboration between the photographer and the subject. Born in Waterbury, Connecticut, Leibovitz is the third of six children in a Jewish family. Her mother was a modern dance instructor, while her father was a lieutenant colonel in the United States Air Force. The family moved frequently with her fath Anna-Lou "Annie" Leibovitz is an American portrait photographer whose style is marked by a close collaboration between the photographer and the subject. Born in Waterbury, Connecticut, Leibovitz is the third of six children in a Jewish family. Her mother was a modern dance instructor, while her father was a lieutenant colonel in the United States Air Force. The family moved frequently with her father's duty assignments, and she took her first pictures when he was stationed in the Philippines. In high school, she became interested in various artistic endeavours, and began to write and play music. She attended the San Francisco Art Institute. She became interested in photography after taking pictures when she lived in the Philippines, where her Air Force father was stationed during the Vietnam War. For several years, she continued to develop her photography skills while she worked various jobs, including a stint on a kibbutz Amir in Israel for several months in 1969. When Leibovitz returned to America in 1970, she worked for the recently launched Rolling Stone magazine. In 1973, publisher Jann Wenner named Leibovitz chief photographer of Rolling Stone. Leibovitz worked for the magazine until 1983, and her intimate photographs of celebrities helped define the Rolling Stone look. In 1975, Leibovitz served as a concert-tour photographer for The Rolling Stones' Tour of the Americas. Since 1983, Leibovitz has worked as a featured portrait photographer for Vanity Fair.